1Faculty of Agriculture, Sohag University. 2Agric, Econ, Res, Instit- Agric, Res, Center. The Egyptian agricultural sector is considered one of the important sectors to achieve many achievements, through which the national product can be magnified for its important role in foreign trade. The agricultural sector plays a major role through its contribution to the development of agricultural exports. Potato is one of the most promising export crops in terms of global demand, and the possibility of cultivating them in new lands on the other hand. 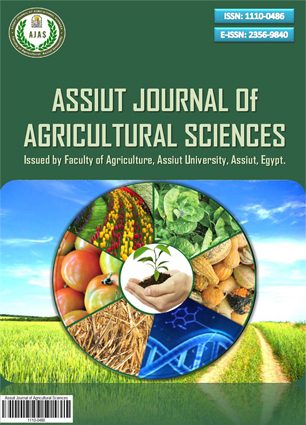 The study aimed at boosting the export of Egyptian potatoes and avoiding the problem of the decline in international markets, while continuing to grow Egyptian exports of potatoes in these markets by knowing the current production status of potato crop and the main features of exports. And work to maximize the export yield of the crop. The study was adopted to achieve its objectives on the descriptive and quantitative method in analyzing the economic data and phenomena related to the subject of the study, as well as the use of statistical analysis methods to measure the effect of some economic factors that serve the objective of the research. 1- The cultivated area increased by 18.73 thousand feddans annually during the study period (2002-2015). 2- An increase of kidney production by 227.3 thousand tons per year during the study period (2002-2015). 3. For agricultural exports, it covers only about 42.89% of agricultural imports. Potato exports also cover part of the exports, with exports amounting to about US $ 1,487.5 million in the period of study. The exported quantity increases annually by 2.78 thousand tons. 4 - For the indicators of competitive advantage, it was found that Egypt has a competitive advantage for the export of potatoes compared to Britain, Italy, Russia, Greece, Germany, America, Canada, which are competing countries in the export of potatoes to certain countries. 5. The percentage of potatoes production in Egypt to the total world production was 0.91%, which made it the fourth largest among the producing countries. However, the proportion of potato exports to the total exports of the world was estimated at 4.3%. This is a low ratio. This requires reconsideration of export policies. Competitive position. 6- The Egyptian exports of potatoes are concentrated in Egypt, where 92.72% of them are exported to six countries. According to the Gini coefficient, exports to Italy ranked first with about 24.62%. The share of potato exports to Arab countries (Lebanon) was about 13.56% Of total potatos exports in the study period. 7- The market penetration rate was low for the Egyptian potato importers during the period (2002-2015), which indicates that Egypt's potato can not penetrate these markets. This means that Egypt does not have a competitive advantage in these markets. It has also been shown that there are countries whose imports have increased and others have decreased. This requires attention to export policies and support for the competitive position. یلعب قطاع الزراعة فى المقتصد القومى المصرى دورا رئیسیاً من خلال مساهمته فى تنمیة الصادرات الزراعیة، والتى تمثل حوالى 85,9% من إجمالى الصادرات الکلیة فى عام 2015. وتعتبر البطاطس من المحاصیل التصدیریة الواعدة من حیث الطلب العالمی ، هذا فضلاً عن إمکانیة زراعتها على مدار العام من ناحیة ، وإمکانیة زراعتها فى الأراضى الجدیدة من ناحیة أخرى. کما تعد البطاطس أحد المحاصیل الهامة من حیث القیمة الغذائیة حیث تشغل الترتیب الرابع بعد القمح والذرة والأرز ، والترتیب الأول فی إنتاج الطاقة، والثانی فی إنتاج البروتینات بعد فول الصویا. وقد واجه القطاع الزراعی المصری بعد تطبیق سیاسة التحرر الإقتصادى مشکلة ارتفاع تکلفة الإنتاج ، والتی انعکست على أسعار المنتجات النهائیة الأمر الذی أدى إلى ارتفاع تکلفتها بدرجة کبیرة ، ولم یکن من الممکن منافسة السلع المماثلة بالأسواق الأخرى الأقل تکلفة ، وکان لذلک أثره الواضح على القدرة التنافسیة للعدید من المنتجات الزراعیة المصریة والتى منها على سبیل المثال لا الحصرالبطاطس. هذا بالإضافة إلى أن الصادرات الزراعیة تتأثر بنوعیة وجودة المنتج الزراعی من ناحیة، وبعض العملیات التسویقیة من ناحیة أخرى ، والتى لعل من أهمها عملیات الفرز والتدریج والتعبئة والنقل والتخزین. ویتصف أداء هذه العملیات بانخفاض کفاءتها وارتفاع أسعارها، الأمر الذی یؤثر سلباً على القدرة التنافسیة للسلع الزراعیة المصریة فى الأسواق الخارجیة. کذلک یواجه المنتج الزراعی المصری مشکلة الإنتاج فى ظل غیاب المعلومات التسویقیة الداخلیة والخارجیة، مما یؤدى إلى صعوبة اتخاذ القرارات الإنتاجیة المتعلقة بالإنتاج للسوق الخارجی.